Spring is on its way and my cats are biting their cheeks to go outside to enjoy the greater outdoors. There has probably been no single issue debated among pet owners whether the Kitty should be allowed to spend time outdoors. Most veterinarians urge owners to keep their pets in the house because they will live longer and safer lives. It is a sobering affect that more than a million outdoor cats are killed each year by dogs, traffic and exposure to disease. The average indoor cat lives longer than 12 years, while the average outdoor cat survives for less than five years. If you decide to let your cat outdoors and enjoy there natural instinct to prowl and pounce, you need to supervise his or her outdoor play time to ensure their safety from the many hazards of the great outdoors. One solution I have found is the Kittywalk Cat Enclosures system allowing the favorite cat to enjoy the outdoors in a containment system. 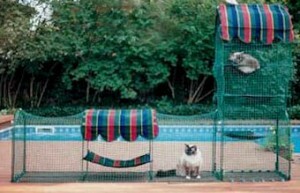 Kittywalk© Systems Outdoor Cat Enclosures provides a way to allow your cat to roam in the outdoors safely and securely. Now you don’t have to supervise your cat whenever your pet goes outside. Simply place your pet in the customizable cat enclosure and let them have fun in the fresh air. Just remember if you let your cat outside don’t allow unlimited access, never leave your cat alone outdoors when you are away from home and always be sure your cat is wearing the proper identification because your cat can disappear in seconds.